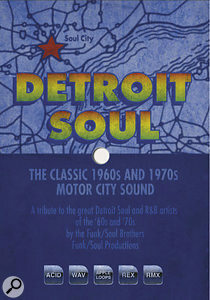 Detroit and Motown: two names that both evoke a rich musical heritage and still continue to provide a major influence today, as seen in the recent raw soul of the Dap‑Kings and pop smashes of Messrs. Ronson and Plan B. 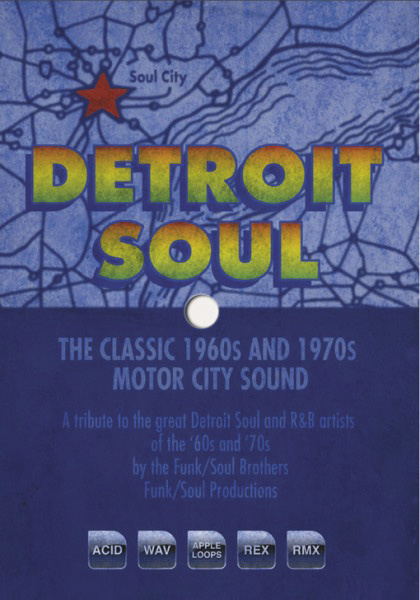 To aid in getting some of those classic Motor City vibes into your productions, Big Fish Audio have collected together a sample library that aims to capture that classic soul sound. Housed on a single DVD, the 2.8GB of content is split into 28 kits and covers all the usual formats (Acid WAV, Apple Loops, REX and Stylus RMX). Each kit folder carries key info and the tempos range from 53 to 200 bpm. Open a folder and you'll find that each kit contains drums, bass, multiple guitar parts, horns, piano/organ and often some form of percussion. These loops are, in turn, broken down into sections (intro, main riff with variation, and outro). As well as the kit folders, there's a folder containing multitrack stem recordings of the drum tracks. This is a really old‑school touch, and a major bonus for anyone who wants a crack at mixing down the beats themselves. Steve Sechi, the producer, gets a gold star for this inclusion and other sample libraries! Style-wise, all the kits are spot‑on and cover the wide range of vintage soul flavours coming out of the Motown stable in its heyday, as well as some nods to Stax and other major players. Personally, highlights for me include the funkier‑edged kits that reflect an Isaac Hayes/Curtis Mayfield vibe, but that's just my own preference in the source material. The truth is that there's not one dud on offer here, and there's a lasting feeling of a group of like‑minded musicians playing together, which is great, whether actually true or not. Looking at the individual parts, everything is well recorded and played: drums and percussion are excellent, as are the authentic‑sounding guitar and bass parts. The horn section consists of trumpet alongside alto, tenor and baritone sax. Perhaps surprisingly, all the horn licks are provided pre‑mixed together as a section rather than as separate elements. Although this cuts down their flexibility slightly, it is authentic to the period of the musical style, when tracks were limited and grouping essential. More importantly, everything sounds great, and I can see the drops, swells and runs being used in all manner of productions.